Ah, tomato soup. Not only is it inexpensive, but it's a terrific comfort food. You don't need to be limited to eating just soup, though. 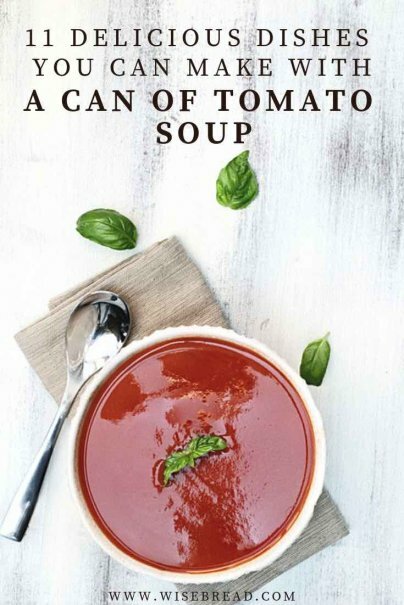 Tomato soup is also a great base for fast meals. Here are 11 delicious dishes to make using that can of comfort food. This one comes from Campbell's Cookbook, published in 1969. Saute one chopped green pepper, one onion, and one minced clove of garlic in a skillet until tender. Stir in a can (10 ¾ ounces) of tomato soup, ⅓ cup of water, two teaspoons of lemon juice, a dash of pepper, and a dash of Tabasco sauce. Add a pound of cooked, cleaned shrimp. Serve over rice. Prepare soup using milk rather than water. Place a handful of tortilla chips in a soup bowl. Sprinkle generously with shredded pepperjack cheese; top with hot soup and a dollop of sour cream. This is good when you have a cold, especially when used in conjunction with a soft quilt and Netflix. This feeds a lot of hungry teenagers. You'll need a large, covered skillet. Heat the olive oil in the skillet and brown the hamburger; drain off any fat. Remove the burger from the skillet and set aside. In the skillet, add the potatoes; salt and pepper generously. On top of the potatoes, add the carrots, a little more salt and pepper; finally, add the corn. Return the meat to the pan, on top of the corn. Combine the soup and water; pour over all. Cover skillet and turn to medium. Cook until potatoes and carrots are tender, adding a little more water if necessary. Sprinkle with cheese. Serve with garlic bread and a salad. The busier I get, the bigger fan I have become of slow cookers. This lasagna, using tomato soup, is easy to throw together quickly. While the shape will be more like, well, a stew, you'll still get the lasagna flavors. I skipped the bouillon cubes altogether and used one cup of red wine in place of one of the cups of water. Yum! Serve with garlic bread. A grilled cheese sandwich is always a natural with tomato soup. Amp that up by cutting your sandwich up into little squares, and then float those on the top of your soup as "croutons." Cube and steam butternut squash. Add a teaspoon of red curry sauce to the prepared soup, and a tablespoon of creamy peanut butter. Stir well and serve it over jasmine rice. Sprinkle with chopped peanuts. Add leftover hamburger, diced chicken, or chopped ham to the prepared soup. Serve over noodles. Sprinkle with parsley for a little color. Combine a pound of cooked, ground beef (or turkey) with a cup of cooked brown rice, two tablespoons of diced shallots, and a beaten egg. Stir together; add ¼ teaspoon of pepper and a teaspoon of garlic salt. Cook eight cabbage leaves in boiling, salted water for 3–4 minutes to soften them. Drain. Roll meat mixture in drained cabbage leaves, and place in skillet. Combine a can of tomato soup and a can of water; pour over rolls in skillet. Cover and cook over low heat for about 30 minutes, spooning tomato soup mixture over frequently. Slice eight hot dogs (any type, even tofu) and heat in a pan in a little olive oil. Add a teaspoon of prepared mustard, a can of tomato soup, a dash of Worcestershire, and a half-can of water. Heat until bubbly. Prepare hot noodles (two cups). Serve mixture of over hot, buttered noodles. If you add some cream cheese (stir well) to the soup, the result will be absolutely decadent. I feel very guilty doing this so I just use a tablespoon or two. Add a small handful of baby spinach leaves and stir in for a delicious lunch. Season and flour a pound of beef or pork cubes. In a Dutch oven, brown meat in two tablespoons of shortening or oil. Add a can of tomato soup, a soup can of water, a third of a bag of frozen pearl onions, three carrots, peeled and halved, and three potatoes, peeled and quartered. Add a soup can of red wine. Toss in a teaspoon of thyme, a teaspoon of garlic salt, and sprinkle with a little pepper. Put the lid on and simmer for an hour, stirring occasionally. What other tomato soup dinners can you make? Share with us!